Children’s Oral Health: What Are the Things You Should Know? Children are often seen with cute, adorable smiles. They melt everyone’s hearts when they start to show their ever glowing grin. But behind those lovely little curves are the backbone that keeps them smiling – the oral health. The oral health of children can sometimes be misunderstood. Just because kids have healthy-looking smiles doesn’t mean that their mouth, teeth, and gums are entirely free from diseases and irregularities. 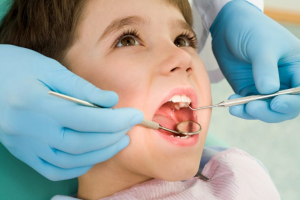 To give parents a more definite view regarding the dental health of their kids, we at Shawn A. Walls, DDS listed some important information. Even before the first tooth of children erupts, their mouth is already susceptible to harmful bacterias. So for parents to prevent their child’s gums from gathering thousands of unwanted particles, good oral hygiene must be practiced. When cleaning your little one’s mouth, you may use a soft cloth or infant toothbrush. Doing this routine twice daily is advised. After children reached their first milestones, bringing them to the dentist is highly recommended. An early dental visit helps build excellent oral care to kids. And when it comes to pediatric dentistry services, you can fully rely on us at Shawn A. Walls, DDS. We have caring and approachable staff to give your child a pleasant dental experience. Kids are prone to tooth decay. In fact, cavities are considered a chronic condition that impacts a lot of children in America. As stated by CDC (Centers for Disease Control and Prevention), 20 percent of children with the ages of 5 to 11 have at least a single untreated decayed tooth. Parents play a significant role in keeping their child’s mouth cavity-free. Nevertheless, it is also found out that most mothers are the reason why their little ones accumulate the condition. The Streptococcus mutans, when transferred to children’s mouth, can activate dental caries. To halt this from happening, parents must see to it that their oral health is in top shape. Remember that good oral hygiene practices can prevent the spread of oral problems. Protecting children’s oral health is always possible. By seeing the dentist regularly for preventive care services, tooth decay will have no room to ruin the smile of your little ones. Shawn A. Walls, DDS is always ready to take action involving you and your child’s oral health. If you want your kids to experience secure and more child-friendly Pediatric Dentistry services in Johns Creek, GA, visit us and book your appointment at 10700 Medlock Bridge Rd., # 202, Johns Creek, GA 30097.